The previous article told the story behind the many paintings of the Temptation of Saint Anthony, and I showed examples from 1430 to 1560. These demonstrated the influence of Bosch’s highly individualistic paintings, particularly his triptych now in Lisbon, at least in northern European painting. 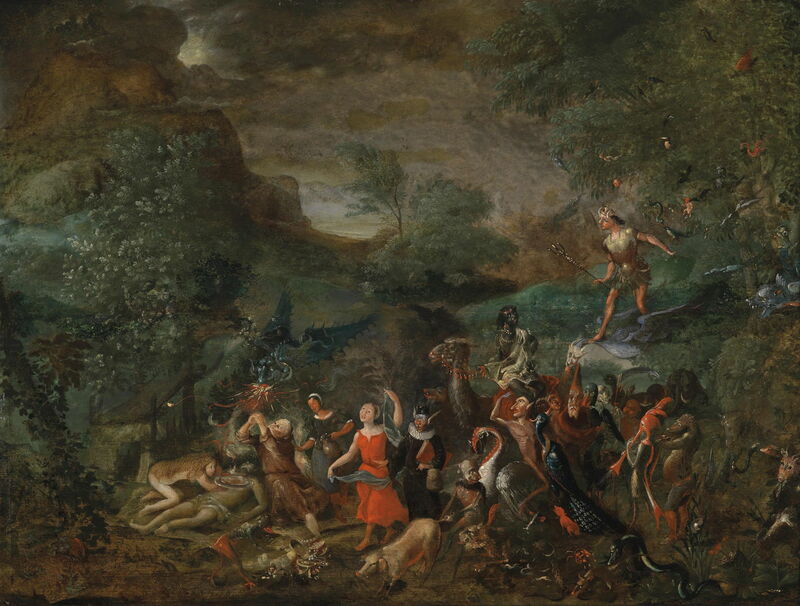 Unknown, The Temptation of Saint Anthony (c 1575), oil on panel, 55 x 71 cm, location not known. Wikimedia Commons. Although the artist who painted this work in about 1575 is not known, it appears to have originated in northern Europe, and has fantastic creatures which are still rooted in the real world. There are some indications of potential influence from Bosch, such as the red creature with a trumpet-like snout, but most remain more traditional. Pieter Huys (c 1519–1584), The Temptation of Saint Anthony (1577), color on wood, 76 × 94 cm, Museum Mayer van den Bergh, Antwerp. Wikimedia Commons. 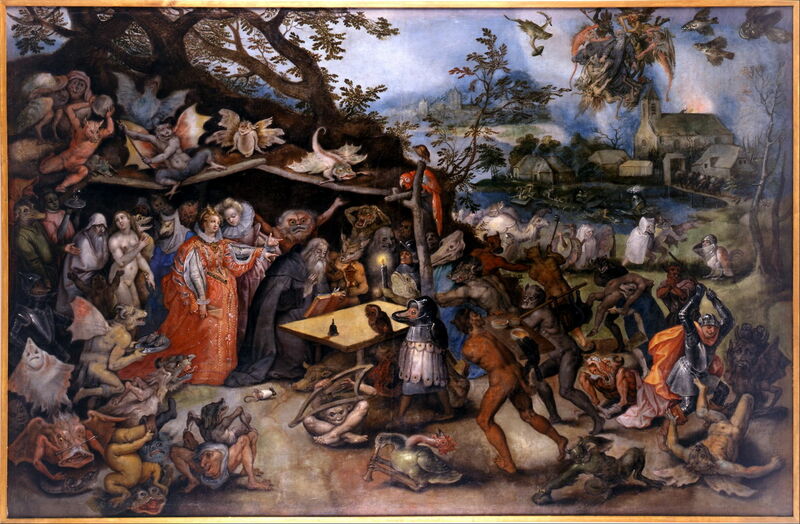 Pieter Huys’s painting of 1577 is more obviously a derivative from Bosch. Saint Anthony could almost have been copied from one of the earlier paintings, and most of the strange figures and creatures have been borrowed and re-interpreted. Musical instruments such as the lute and harp make an appearance, but many of the symbols have been changed. For example, where Bosch’s triptych features round tables with a white cloth, Huys opts for a rectangular table. And the background has a town burning even more violently. Maerten de Vos’s vision of 1591-4 follows a more traditional line again, although it contains some strange elements which appear more personal. He shows one Saint Antony apparently carrying another, unconscious Saint Anthony in his arms, rather than the saint supported by friends. There is a third version of the saint flying in the air, surrounded by daemons, too. That unconscious saint points to a pig, a recognised attribute, but nearby is a pair of lions. 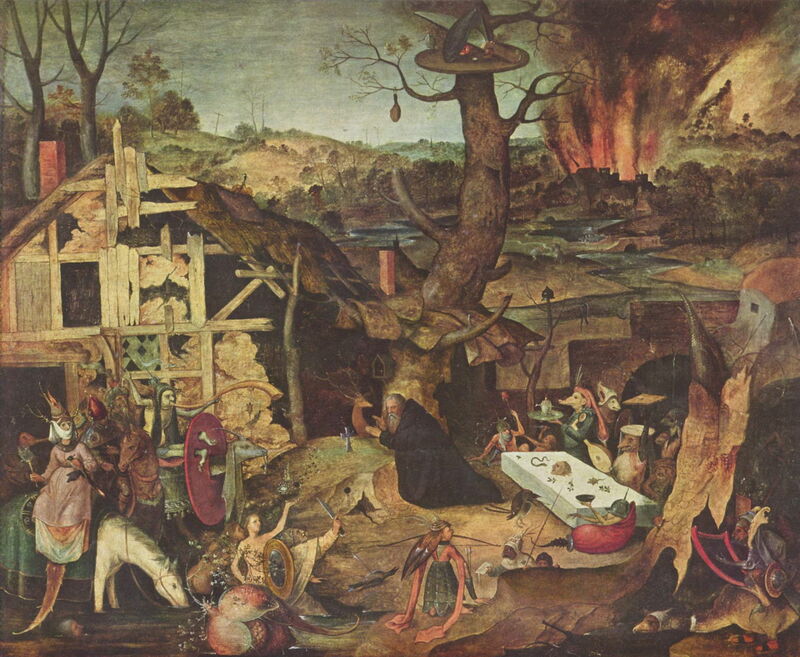 One of the more Bosch-like creatures in the right foreground is a portmanteau of human and bird, wears an inverted funnel on its head, and is reading sheet music. Just a century after Bosch painted his triptych, Jan Brueghel the Elder combines a cavalcade of more traditional figures with a foreground of more bizarre ones derived from Bosch, including an old person’s head with four human legs, and a bird with two heads, one of a cockerel and the other a duck with a clarinet-like bill. A second image of the saint appears in the sky, surrounded by daemons, and a church is on fire in the background. 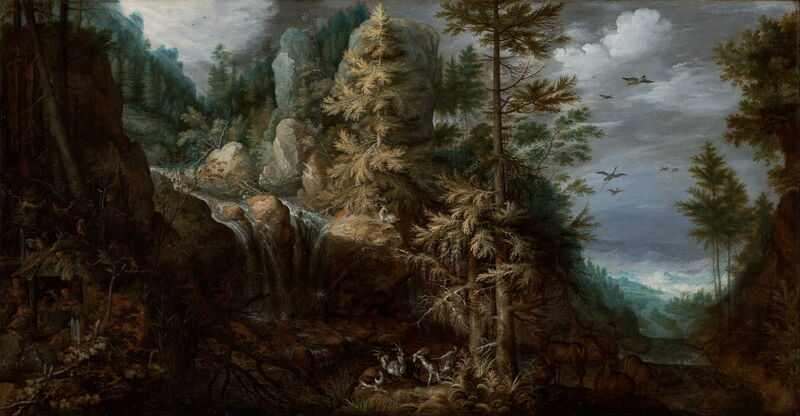 Roelandt Savery (1576-1639), Landscape with the Temptation of Saint Anthony (1617), oil on panel, 48.7 x 94 cm, Getty Center, J Paul Getty Museum, Los Angeles. Wikimedia Commons. 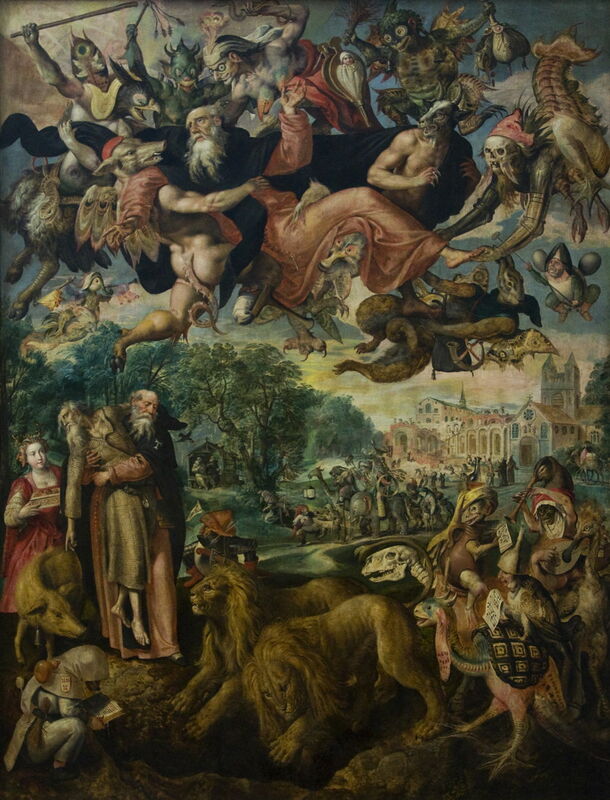 Roelandt Savery’s Landscape with the Temptation of Saint Anthony (1617) is an unusual painting in which the religious content is hidden away in the bottom left corner; the daemons and other creatures there appear to have had a little influence from Bosch, but the great majority of the work is a landscape, and not that of a wilderness either. Joos van Craesbeeck (c 1605–1654/1661), The Temptation of Saint Anthony (c 1650), oil on canvas, 78 x 116 cm, Staatliche Kunsthalle, Karlsruhe, Germany. Wikimedia Commons. 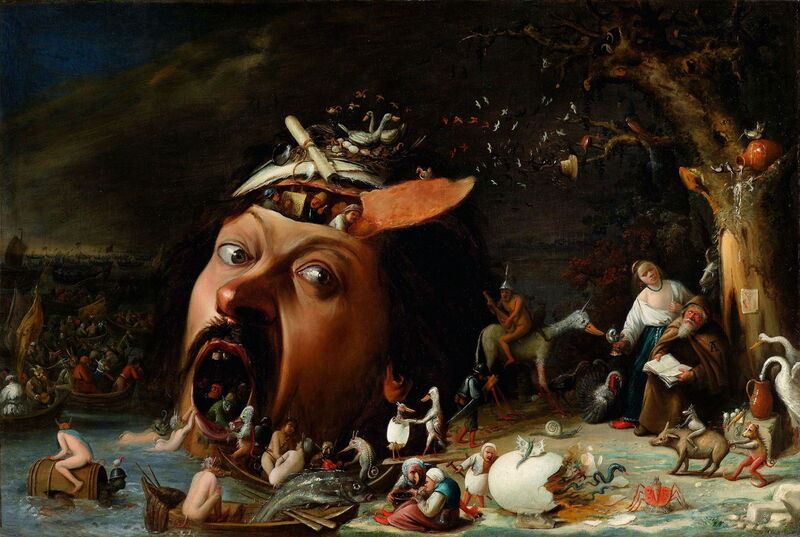 By about 1650, Joos van Craesbeeck was using some of Bosch’s iconography with his own developments. The use of a human head as a container is probably derived from Bosch’s tree-man and similar devices, but here has become even more realistic. To the right of that, a naked man sits facing backwards on a duck-horse: he is playing a stringed musical instrument, and wearing an inverted funnel on his head. Van Craesbeeck’s humans seem to have grown small red tails too. Oddly, van Craesbeeck does not place the Greek letter Tau on the saint’s robes, but the Roman letter A, perhaps monogrammed with the Tau. That appears to be unique to this painting. 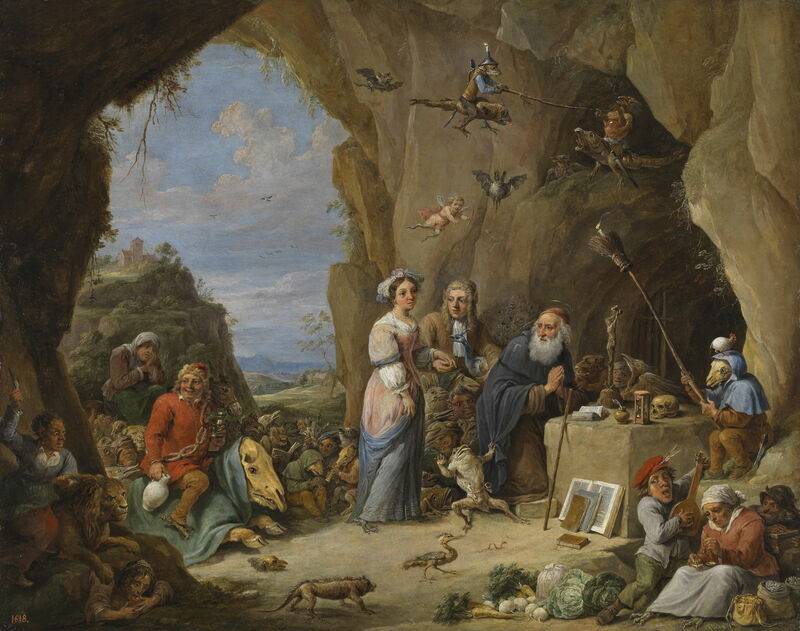 David Teniers the Younger (1610–1690), The Temptation of Saint Anthony (c 1660), media and dimensions not known, Palais des Beaux-Arts, Lille, France. Wikimedia Commons. 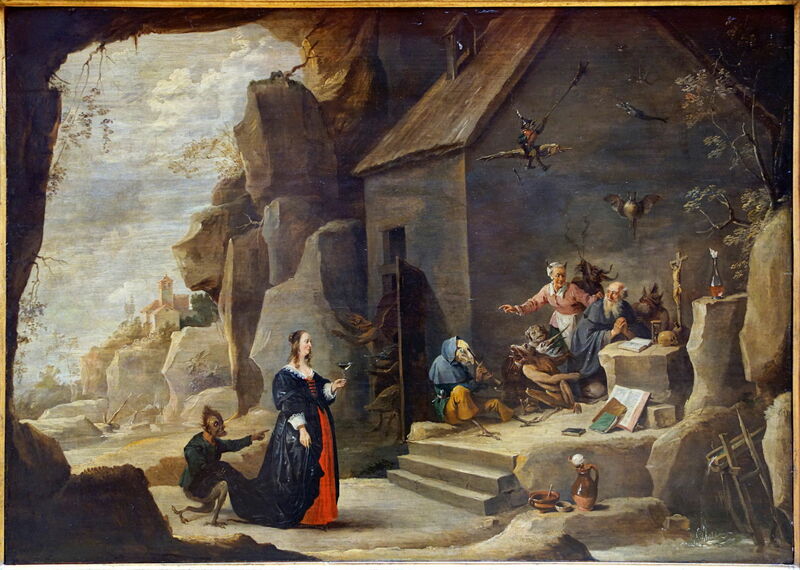 The prolific David Teniers the Younger painted several versions of the Temptation of Saint Anthony after about 1650. 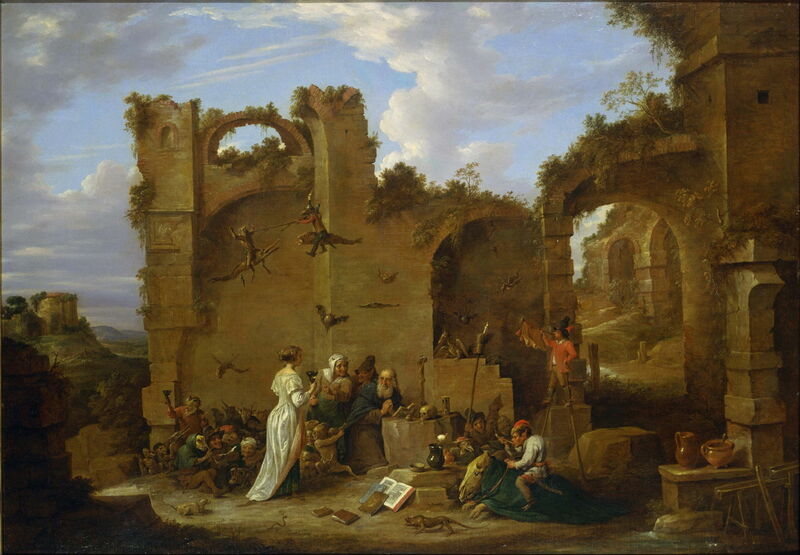 Most, like this painting now in Lille, show an ordinary landscape with the saint, with the addition of his own species of daemons. Some of these re-use ideas first seen in Bosch’s triptych, such as that of a single figure on the back of a flying narwhal; that figure is wearing an inverted funnel on its head. David Teniers the Younger (1610–1690), The Temptation of Saint Anthony (c 1650), oil on copper, 55 × 69 cm, Museo Nacional del Prado, Madrid. Wikimedia Commons. Another of Teniers’ paintings, currently in the Prado, shows three fairly normal humans in a menagerie of daemons, some of which clearly have their origins in Bosch’s work. The figure flying on a fish has changed from the previous painting, but still wears its distinctive inverted funnel. David Teniers the Younger (1610-1690), The Temptation of Saint Anthony (c 1650), oil on canvas, 80 x 110 cm, National Museum of Western Art, Tokyo. Wikimedia Commons. This third version, now in Tokyo, repeats many of the same daemons in a different setting, retaining the figure wearing the inverted funnel in close aerial combat. 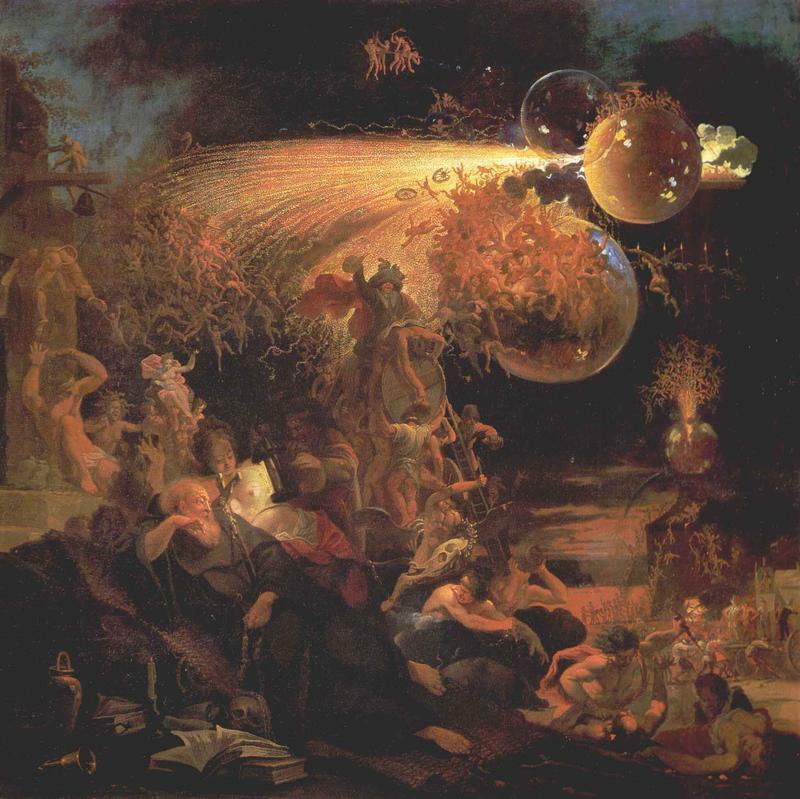 Almost two centuries after Bosch’s triptych, more radically different and inventive approaches appear, here in Domenicus van Wijnen’s painting of about 1685. Its daemons are much more human in form, and have proliferated in a way more common in the ‘fairie paintings’ seen around 1840, including some by Richard Dadd. Giovanni Battista Tiepolo (1696–1770), The Temptation of Saint Anthony (c 1740), oil on canvas, 40 x 47 cm, Pinacoteca di Brera, Milan. Wikimedia Commons. 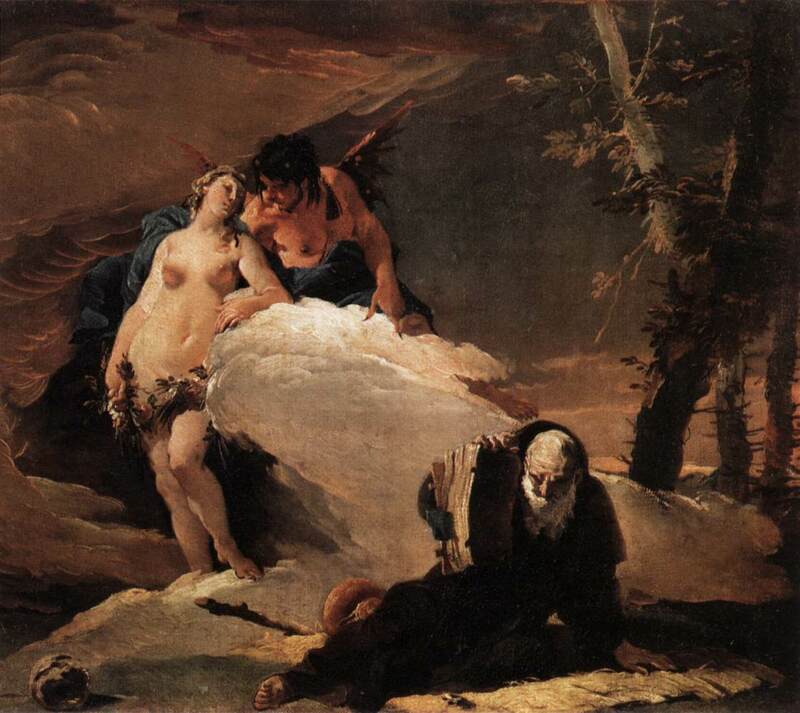 Southern European painters were much more likely to keep to more traditional figurative compositions, as used by Tiepolo in about 1740. This is surprising, given the presence of Bosch’s paintings in major collections in both Madrid and Venice. Henri Fantin-Latour (1836–1904), The Temptation of Saint Anthony (c 1875), oil on canvas, 63.5 x 83.5 cm, National Museum of Western Art, Tokyo. Wikimedia Commons. Depictions of the Temptation of Saint Anthony remained popular even through the 1800s, although by this time Bosch’s triptych seems to have become long forgotten, and painters seemed no longer to need such excuses to exercise their imagination and inventiveness. The long-awaited publication of Gustave Flaubert’s book The Temptation of Saint Anthony, written as a script for a play, in 1874 brought renewed interest, and a succession of paintings from Henri Fantin-Latour (c 1875, above), Paul Cézanne (c 1875, below), Gustave Moreau (a watercolour), and Fernand Khnopff (1883). 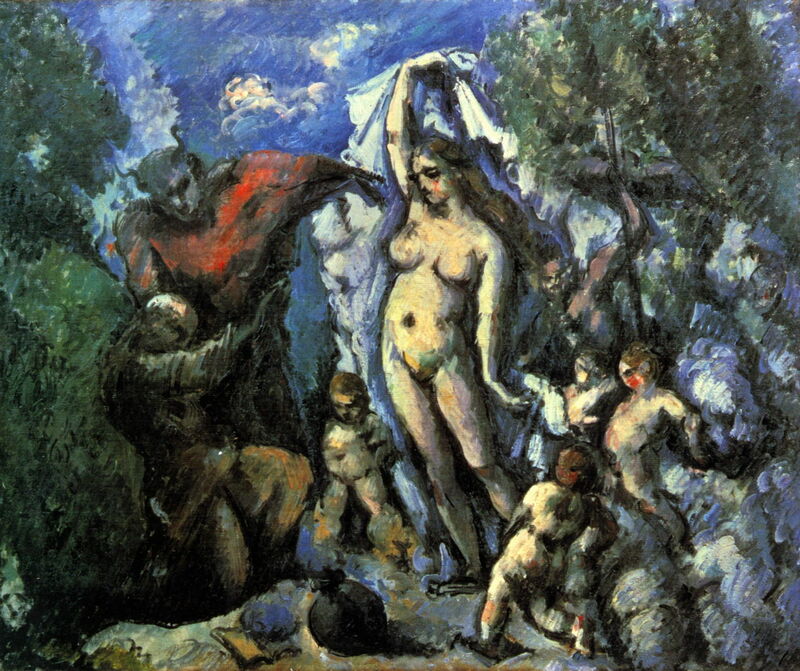 Cézanne shows the shadowy figure of Saint Anthony slumped against a bush at the left, his arms held out to shield himself from the temptations. The devil is shown, in stereotypical form, wearing red robes, with an animal head and horns, behind Saint Anthony. In front of them is the naked Queen of Sheba, her right arm held high to accentuate her form. Around her are naked (but not black) children. In front of Saint Anthony is a black bag presumably containing money, and a book. 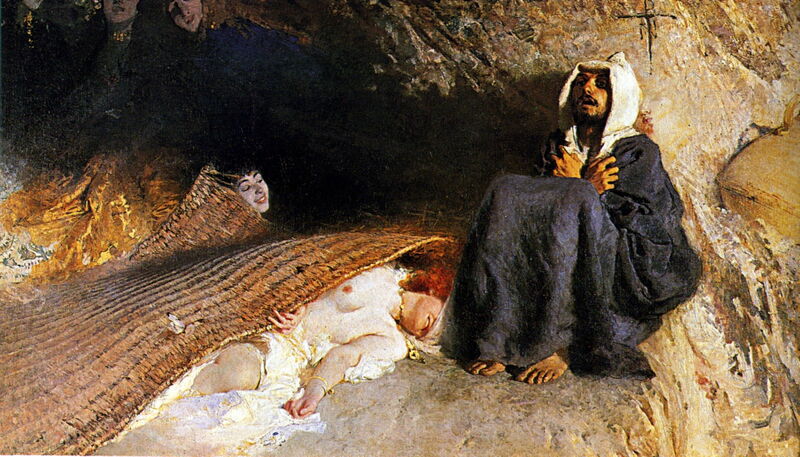 Domenico Morelli (1823–1901), The Temptation of Saint Anthony (1878), oil on canvas, 137 × 225 cm, Galleria Nazionale d’Arte Moderna, Rome. Wikimedia Commons. The influential Neapolitan realist Domenico Morelli painted this stark work in 1878, perhaps the exact antithesis of the rich imagery which had developed since the Renaissance. 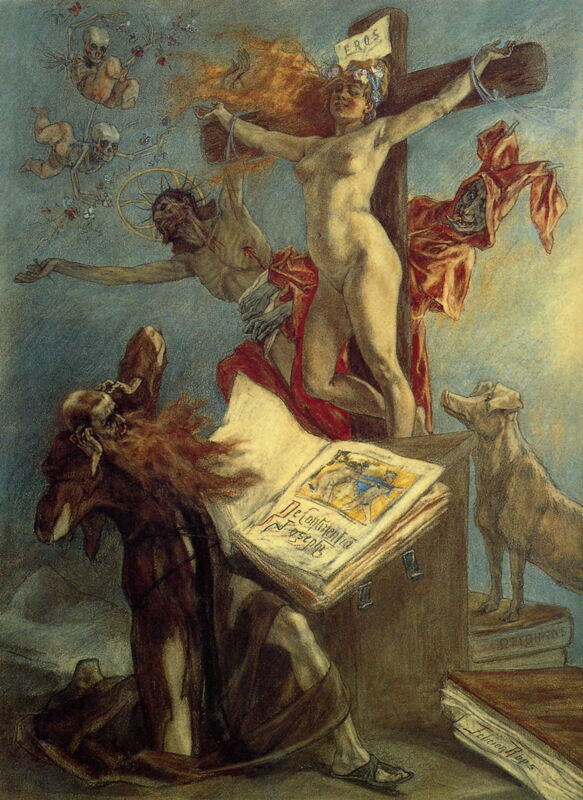 That same year, Félicien Rops painted his satirical and irreverent version, which has more subtle details. Bound to the cross in Saint Anthony’s tempting vision is a visibly voluptuous woman, the word EROS replacing the normal initialism of INRI (Iēsūs/Iēsus Nazarēnus, Rēx Iūdaeōrum, meaning Jesus of Nazareth, the King of the Jews) shown above Christ’s head. Christ himself, with full stigmata, has been knocked sideways to accommodate the woman’s naked body. Behind the cross the horned devil wears scarlet robes and pulls faces. Behind him is a pig, Anthony’s attribute. The two daemonic putti are decidedly not references to Bosch. 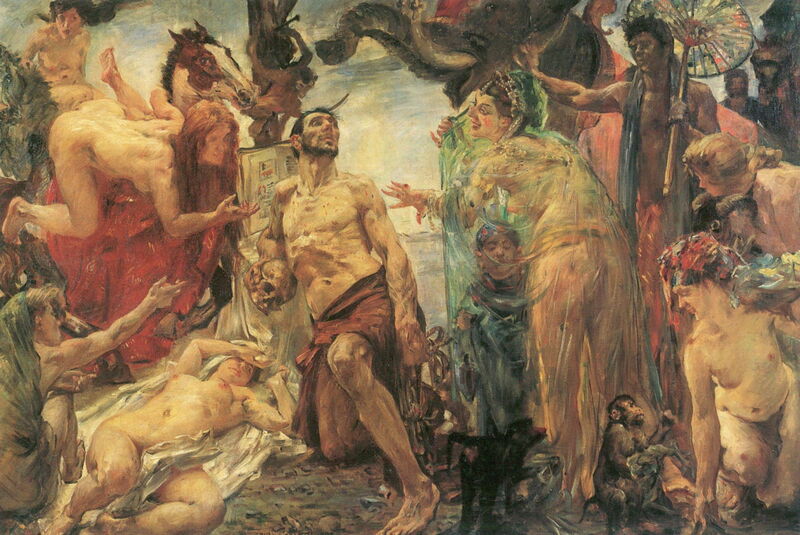 Lovis Corinth (1858–1925), The Temptation of Saint Anthony (1897), oil on canvas, 88 × 107 cm, Bayerische Staatsgemäldesammlungen, Munich. Wikimedia Commons. 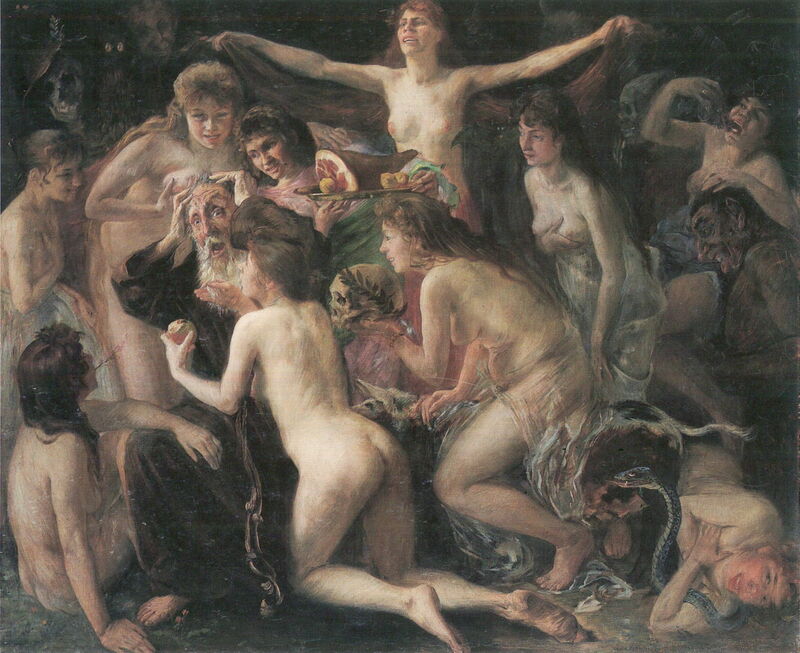 Lovis Corinth painted two versions of the Temptation. 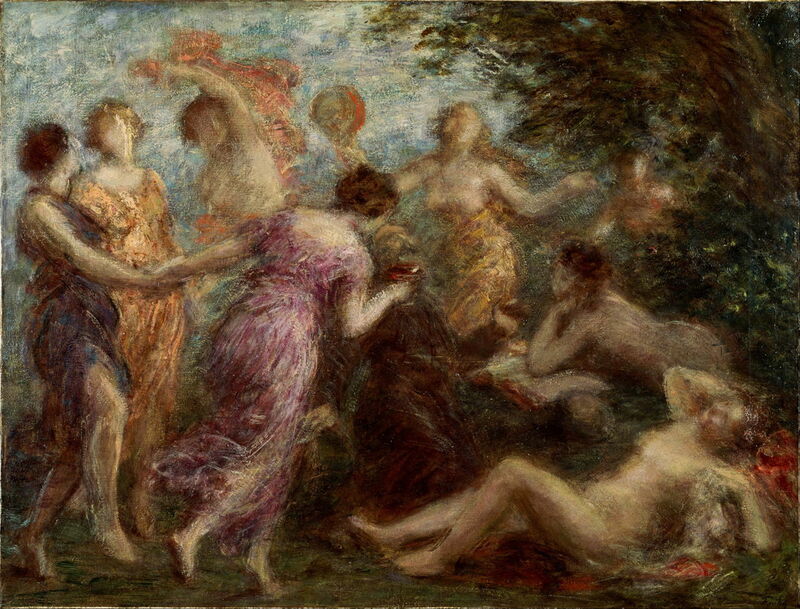 The earlier, in 1897, shows Anthony surrounded by beautiful and naked women, offering him fruit, other food, and their bodies. The daemons have faded into the background, and are caricatures based on humans. Lovis Corinth (1858–1925), The Temptation of Saint Anthony (after Gustave Flaubert) (1908), oil on canvas, 135.3 × 200.3 cm, The Tate Gallery, London. Wikimedia Commons. His later painting, explicitly painted after Gustave Flaubert, in 1908, brings in the Queen of Sheba, an elephant and monkey, but is also notable for depicting Anthony as a young man. Even Salvador Dalí’s 1946 painting of the Temptation steers clear of Bosch’s imagery, although it does at least return to the concept of an individualistic and inventive vision. I have surveyed four paintings from the 1400s, before Bosch’s triptych was painted, Bosch’s two paintings (the left wing of the Hermit Saints triptych, and the triptych now in Lisbon), eleven subsequent paintings from the 1500s, seven from the 1600s, one from the 1700s, seven from the 1800s, and two from the 1900s: a total of 34 paintings over a period of just over 500 years. Bosch’s triptych had a clear visual influence on many of the paintings produced in northern Europe during the 1500s and 1600s. This was reflected in many of the daemons shown in them, particularly the peculiar use of the inverted funnel as a hat, a symbol which had previously been used to indicate Jews in miniatures in the late 1100s. It has also commonly led to a background in which buildings were burning. This may have arisen with the use of common source material, but is more likely the result of later artists having seen Bosch’s paintings. Prior to Bosch, and after 1700, daemons shown were more obviously derivatives of human figures, with classical features such as tails and horns, which remained characteristic of paintings made in southern Europe throughout the period. It is not clear why Bosch’s influence should have vanished after 1700, though. Posted in General, Painting and tagged Cézanne, Corinth, Fantin-Latour, Huys, Morelli, narrative, painting, Rops, Teniers, Tiepolo, van Craesbeeck, van Wijnen. Bookmark the permalink.